Winter blues: Pollutants stick to moist wires in winter, often resulting in short circuits. If there are more power failures this winter, blame the shortage of helicopters in the country. 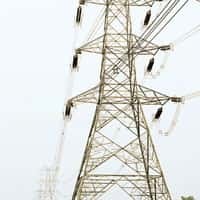 The unavailability of helicopters has forced Power Grid Corp. of India Ltd (PGCIL), the state-owned power transmission utility, to postpone a project to clean its high-tension grid systems. The cleaning would have prevented dust from settling on lines. The problem is exacerbated during winter when fog sets in and makes the lines moist, thereby enabling atmospheric pollution to stick to them. This often results in short circuits that may trigger a grid collapse. “We were planning to undertake hot-line cleaning of insulators in northern region. The cleaning operation was to be done around October-November. We could not press the helicopters into the service as the vendor’s fleet was busy," said a senior executive at PGCIL, who did not wish to be identified. The vendor, Pawan Hans Helicopters Ltd, could not commit its fleet’s services because of logistical issues. R.K. Tyagi, chairman and managing director of Pawan Hans, declined to comment. The new cleaning system, which is used in many other countries, was to have been tried out for the first time in the country this winter. It was viewed as a preventive measure against major grid disturbance in fog conditions and would have cost the company around Rs8.19 crore. The company had identified critical lines in north India for cleaning based on their history of breakdowns. “Since this is a huge task we will try doing it next year," the PGCIL official added. At present, there are five regional grids in India—northern, southern, eastern, and north-eastern and western—and all of them, except the southern one, are interconnected. Grid collapse is the worst-case scenario for any transmission utility. In such an event, states that draw power from that particular grid go without power. The transmission sector has been a key focus for the government, with a proposed Rs14 trillion national grid that will more than double the country’s transmission capacity to 37,150MW by 2012. PGCIL closed 2006-07 with revenues of Rs4,082 crore and a net profit of Rs1,088 crore.